We have waited, nagged, watched and waited some more and finally The Bell is serving food from today and we were there for their first night! Our food wasn’t without inaugural hiccups, but we were impressed with the quality of the products and flavours. I can see this being a really good place for a Sunday roast, a burger and beer night or the full gastro blow-out 3 course dinner with wine. We set off with ‘Spicy sweet potato and squash cakes’ – couldn’t detect where the spinach had disappeared to and both the chilli and the aioli need a bit more kick. We found these too sweet overall. 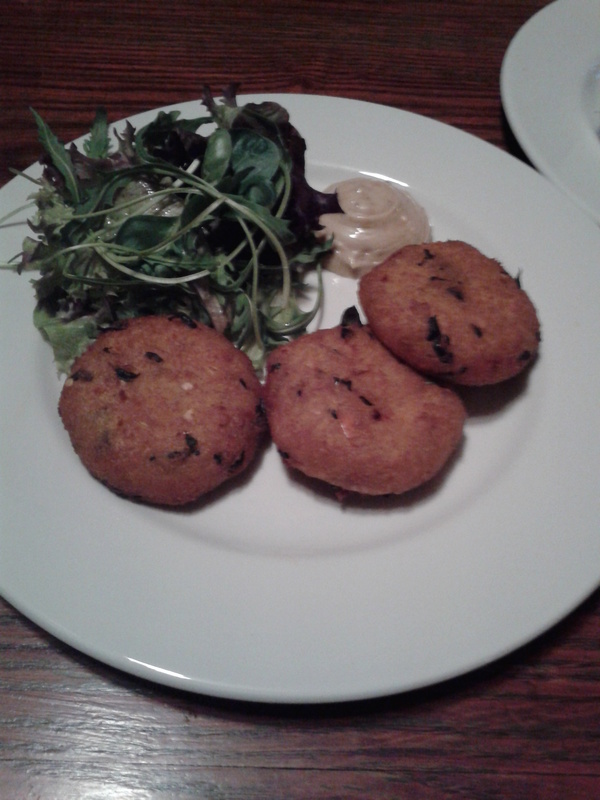 More successful were ‘Smoked ham hock and cheddar croquettes’. 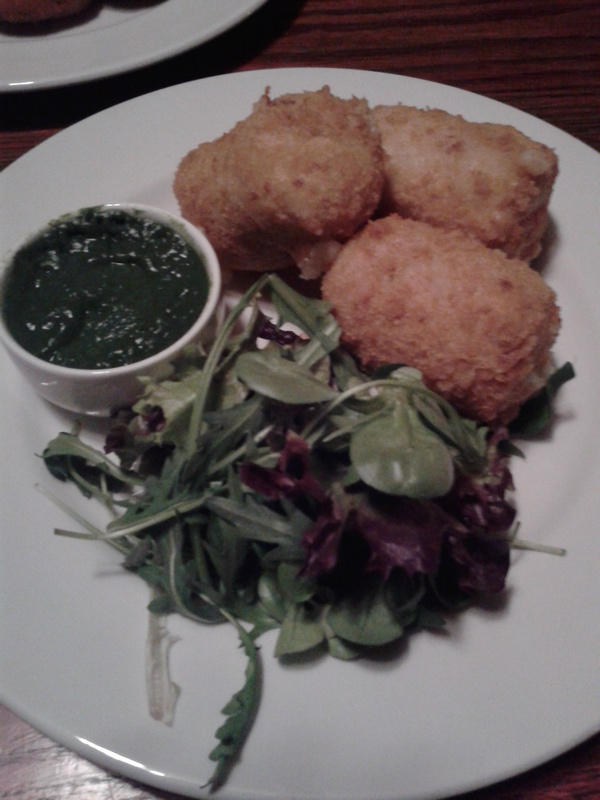 This was a massive portion, served with a surprising hot pea and spinach sauce. Pea and ham genius. Next was the Bell burger and the steak and chips with a great herby butter. The meat tasted really good quality but no one could tell us where it was sourced from. The plan was medium rare but both dishes came out too cold the first time. They were quickly replaced and were more successful. Staff were eager and attentive, and made up for the problematic mains with the offer of a delicious peach Bellini (pun intended I assume!). Once the first few days are over and the chef settles into the kitchen, this will be a great addition to the E17 eating out choices. This entry was posted in Pubs, Restaurants in E17 and tagged food, Sunday roast, The Bell, Walthamstow. Bookmark the permalink. I was there tonight as well (knitting group) and had the arancini balls, which were really good (although I wasn’t keen on the accompanying sauce). Staff were great, and I’ll be eating there again soon. We are looking forward to trying their sunday roast. Saw you all knitting looked fun! Looking forward to trying the sunday roast – used to LOVE The R&C’s roast when Bun did it – but the first week of the new chef was a HUGE disappointment. Mentally huge – and although we used to go at leats a couple of times a month, we haven’t been back for it since! Went there today on my own. 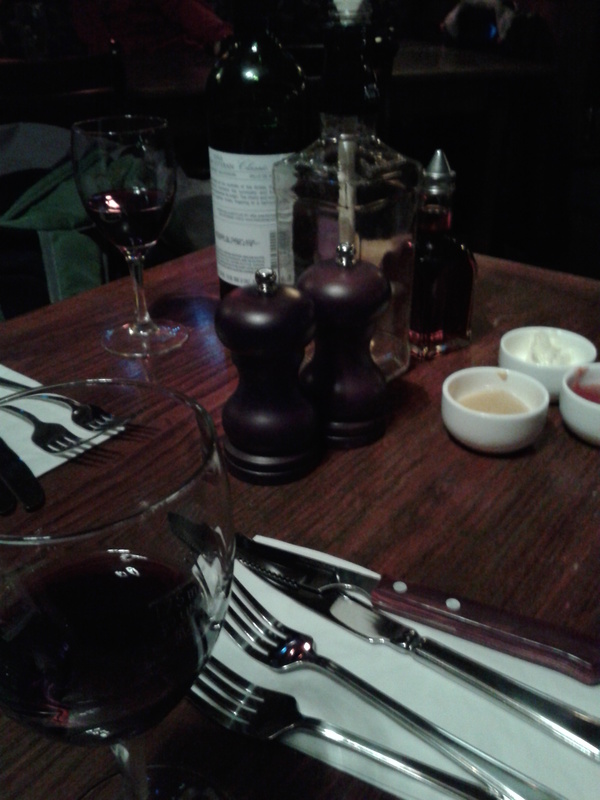 I ordered the Roast Sirloin it tasted good but over cooked for my standards. definitely well done. The veg was a bit tasteless as most veg is nowadays unless you spend time sourcing it properly. Potatoes, gravy and Yorkshire pudding stole the plate for me. The Potatoes were crisp on the outside soft on the inside and definitely looked like they were baked in Duck Fat. The gravy was easy to mop up with the Yorkshire pudding, light and not over salty. Staff were friendly and welcoming. and every body smiling.